Proceeds from this very special magazine will go to the Wales air ambulance service. Character Options, master toy licensee for Doctor Who, is to support a Welsh special school in a unique Doctor Who project, sponsoring the printing and production costs of the school’s one off Doctor Who fan magazine that is written, designed and published by the pupils taking part in the school’s enterprise scheme. The magazine will be available from the school from the 2nd July and costs £3.50 (100 pages). Ysgol-Pen-y-Bryn school in Swansea is a school of 114 pupils with a wide range of specials needs. Each year the Sixth Form run a variety of Enterprise Projects, to gain new skills, learn about enterprise and gain an Agored Cymru Qualification in (Running An Enterprise Project). With this year being the 50th Anniversary of Doctor Who, the group decided that to create a one off magazine based on five decades of the Doctor’s adventures would be a perfect fit and approached Character Options to help fund production, which the company was more than happy to help with. 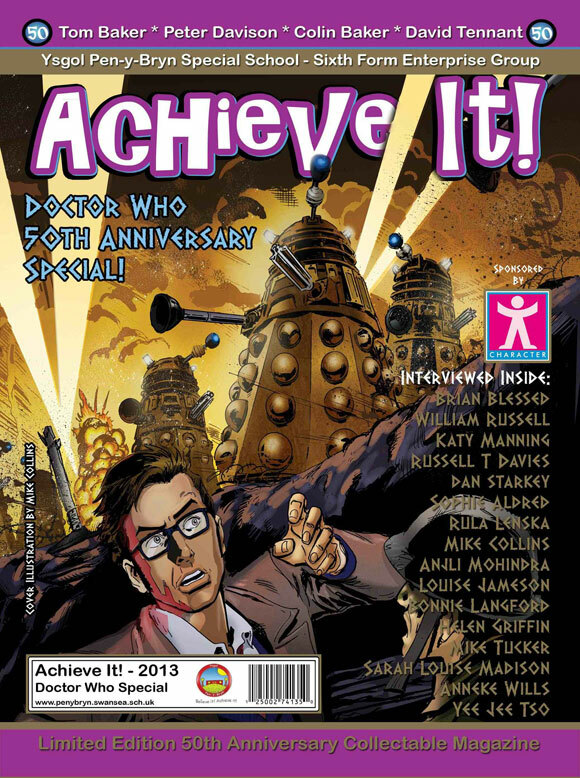 The school’s magazine will be launched on 3rd of July 2013 at an event at the Doctor Who Experience in Cardiff Bay. I have just reserved two Dr Who silver coins by the NZ Mint. They are available for purchase in the UK by one of their official distributors @ http://www.minted-uk.co.uk These folks have let me pre-order on the 11 coin set that has all the images of the past & present Dr’s. I can’t wait to get it. What a great year. I would love to go, but its a bit far away from Cali! I would love to go to the Doctor Who experience but it’s a bit far to go to from Liverpool. Would i be able to buy the ARCHIEVE IT! magazine when it goes on sale on 2nd July priced at £3:50. If I visit the Doctor Who Experience any time soon, I’ll definitely get it!